Dasara is celebrated on the tenth day of the bright fortnight in the month of Ashweyuja or Ashwin. Dasara will be observed on Aswayuja sukla paksha Dasami. One of the most important day of the Sharad Navratri is Dasara. Dasara is the tenth day and the final day which marks the end of the Sharad Navratri festival. Dasara is celebrated on Saturday, 12th October, 2024 . It is widely believed that it was on Dasara that Lord Rama killed the demon Ravana and rescued Sita. 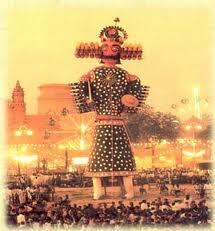 People remember Dasara by burning the effigies of Ravana and Kumbhakarna. The burning of the effigies of Ravana and Kumbhakarna in the Ram Leela Miadan is the most famous in India, where thousands of devotees witness the burning. People dressed in as Rama and Laxmana perform the drama and burn the effigies of Ravana and Kumbhakarna. Dasara marks the day of Visarjan or immersion of Goddess Durga in Kolkata or West Bengal. After worshipping Goddess Durga for nine days with lot of devotion, Goddess Durga is immersed in the nearby rivers or lakes by taking out a grand procession. Performing of Ayudha puja, where in all the vehicles and instruments used in different industries are worshipped is a common practice in some parts of the country. One of the three days of whole year, which is considered to be the best day to start anything new business or new venture is Dasara apart from Akshaya Tritiya and Ugadi or GudiPadwa. Dasara is also known as Vijaya Dasami in some parts of the country.